Distributed Database Backup & Recovery: Enterprise-class distributed backup and recovery for distributed database clusters. In the third IT Brand Pulse survey for this product category, IT Pros voted Veritas as the new leader across the board for Market, Price, Performance, Reliability, Innovation, and Service and Support; unseating previous leader Rubrik Datos IO who had swept the board twice before. 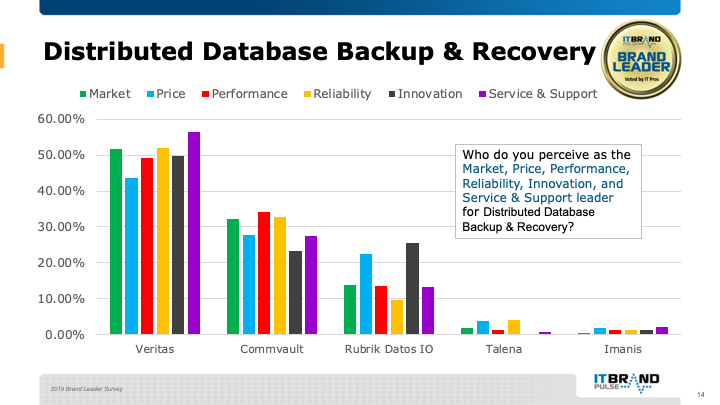 Commvault and Rubrik Datos IO finished as second and third Market leaders, in that order.